Manufacturer: Alfa Romeo Auto S.p.A. 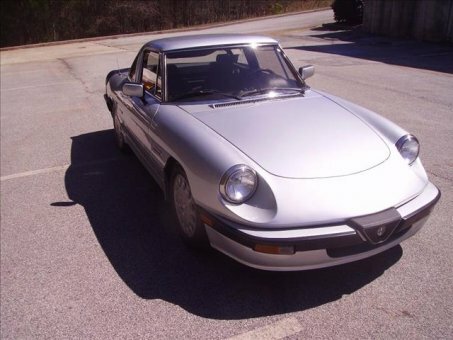 Here is a really clean and well cared for 1987 Alfa Romeo Spider Quadrifoglio Convertible with both the hardtop that is removable and a NEW soft top. This car has the L4 2.0 Liter Fuel Injected engine that runs strong and has the 5 speed manual transmission that shifts great. This car is in great condition and has only 28,000 actual miles. The paint looks good as does the interior. No rips in seats. It has nice red carpet. The power windows work good. It has all new brakes. The tires are good. This car is a blast to drive. It has a clean Carfax with no accidents ever reported. Very clean under the car as well. This is a nice little sports car at a very fair price. Try finding another in this condition for the money.